Grab some whiskey (or your booze of choice) and set yourself up with The Jabberwocky. Be prepared to read. This is a vocal drinking game. This game is best played with an audience. Feel free to exclude rules if you feel they are too much to handle, unreasonable, or just too alcoholic. Out loud, begin reading The Jabberwocky. Read the poem with heart, with fear, with whatever emotion you feel compelled to expel the words with. The game will be that much more enjoyable if participants let themselves be engulfed in the poetry they are drinking with. Especially this poem, for it is action packed and chock full of nonsensical words and tongue twisters! ...A nonsensical adjective is used. Some would say Lewis Carroll was a master of nonsensical language, for he used it often in his literary works. 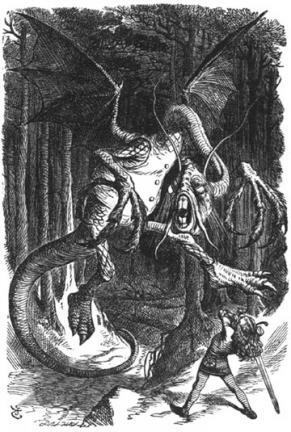 The two words manxome and outgrabe are both words from the poem 'Jabberwocky' unrecognized by the Oxford English Dictionary, but only one of the two is used as an adjective. There are many things to beware that are introduced in this poem, both by the character 'H/he' and the narrator. Procuring an exact number, while being entirely speculative, would be a fruitless effort filled with regret and resulting in minor public outrage. That moment when you go to say 'whiffling' and out slips 'waffles', take a drink. Spoiler alert: someone dies. Guess who.